Commissions provide the bulk of real estate agents' income. 1. Can an Owner Agent Reduce Commissions to Zero? 2. Do I Send a 1099 to a Real Estate Agent? 3. How Much Should You Pay a Buyer's Agent if You Are Selling Your Home Yourself? The real estate sales commission is the percentage of a real estate sales price that is distributed to real estate brokers and agents involved in a transaction. The commission serves as the brokers' and agents' payment for helping the buyers and sellers of a piece of real estate complete the deal. In the majority of deals, the seller is responsible for paying the sales commission. Real estate brokers are licensed to run a business that manages the sales of real estate. They differ from real estate agents, who typically handle the sales. Agents legally must be employed by brokers. When a transaction is completed, the commission is shared by the buyer's broker and the seller's broker, though the seller sometimes receives a larger share. The brokers then pay a portion of the commission to their agents involved in the deal. The agent's share of the broker's commission varies between 30 percent and 75 percent, depending on their experience and past success, according to the National Association of Realtors. The sales commission is not paid until the buyer has paid the seller, ensuring that brokers and agents do not receive their money prematurely. Typically, the seller pays the commission from the buyer's payment on the property. In this way, the seller pays the commission, but the buyer's purchase payment is the source of the funds. In fact, the commission typically is factored into a sales price. Occasionally, the buyer will concede during the negotiating of purchase terms to pay the sales commission directly to the acting brokers, according to the National Association of Realtors. The standard total commission, which is shared by the buyer's broker and the seller's broker, is 6 percent of the purchase price. 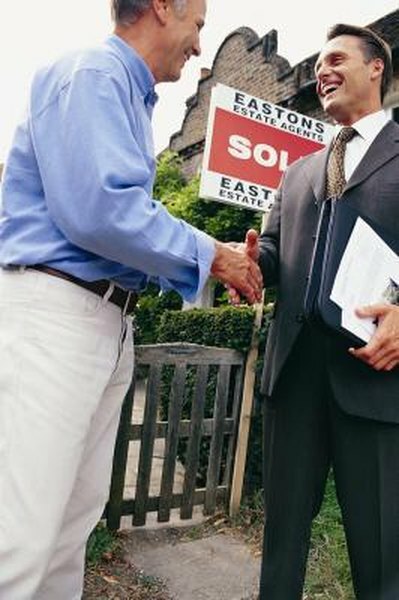 However, brokers may agree to reduced commissions for various reasons, such as to help the buyer and seller come to terms on a deal. In fact, the average commission in 2009 was 5.36 percent, according to a New York Times article. The National Association of Realtors pegs commissions as typically being between 5 percent and 8 percent. A higher commission may come about because of particular efforts or expenses made by an agent to market a property. As an alternative to a commission, some sellers choose to use real estate agents who charge a flat fee for managing the listing of the seller's property on real estate databases. The agents receive the set fee in lieu of commission on the sale. The sellers themselves then are responsible for many of the tasks agents typically handle, such as manning open houses and negotiating with buyers' brokers. Other sellers do not enlist an agent at all. In those cases, sellers often agree to pay a commission from the sale to a buyer's broker, typically of 3 percent or less. National Association of Realtors: How Do Real Estate Agents Get Paid?